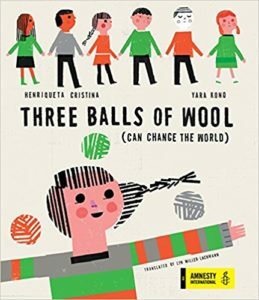 Home » Posts Tagged "Enchanted Lion"
Release day for the Amnesty International co-sponsored Three Balls of Wool (Can Change the World), a picture book of a refugee family in their new home. I meet all three illustrators of books I’ve translated at the opening of an exhibit of works by the Brazilian-Portuguese artist Yara Kono. A report on the “PEN Presents: Translating Books for Young Readers” panel at the Brooklyn Book Festival. Celebrating the publication day of The World in a Second, the picture book I translated from Portuguese. The advance reviews of the book I translated from Portuguese, The World in a Second, have delivered a huge thumbs up and my first starred review ever.